Pingyao’s most notable feature is its centuries-old city wall, which stands ten meters high, a fortress of sloping brick—brown in some lights, gray in others—topped with crenellations through which cannons could be shot if the city needed to defend itself. The six-kilometer-long wall would form a square, if not for its squiggly southern edge. 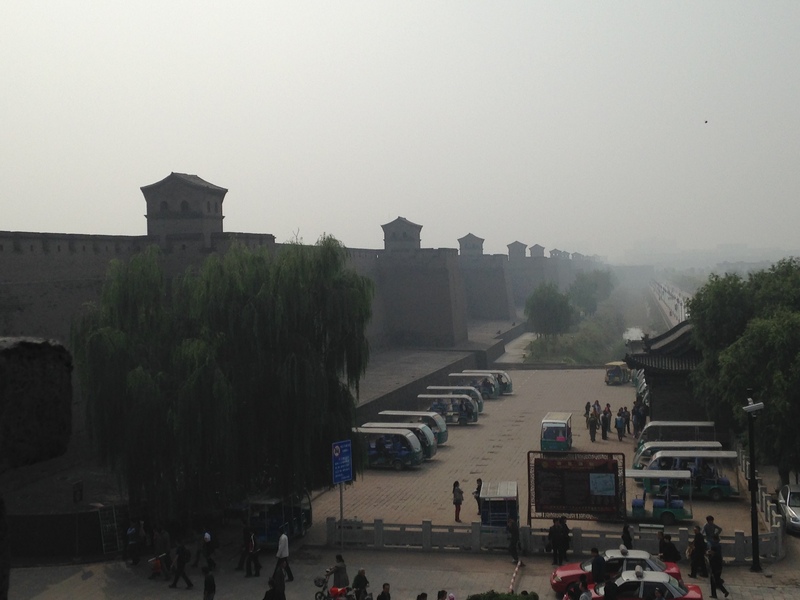 Six main gates punch through the bricks, one each on the northern and southern boundaries, two each on the eastern and western sides, and 72 watchtowers stand at regular intervals along the top, offering Pingyao’s bygone protectors a 360-degree view of anyone approaching the city. Outside the wall lies the “new city,” a typical third-tier agglomeration of overstuffed clothing shops and hole-in-the-wall restaurants, tiled buildings that look old and run-down and probably did shortly after their construction in the last decade. 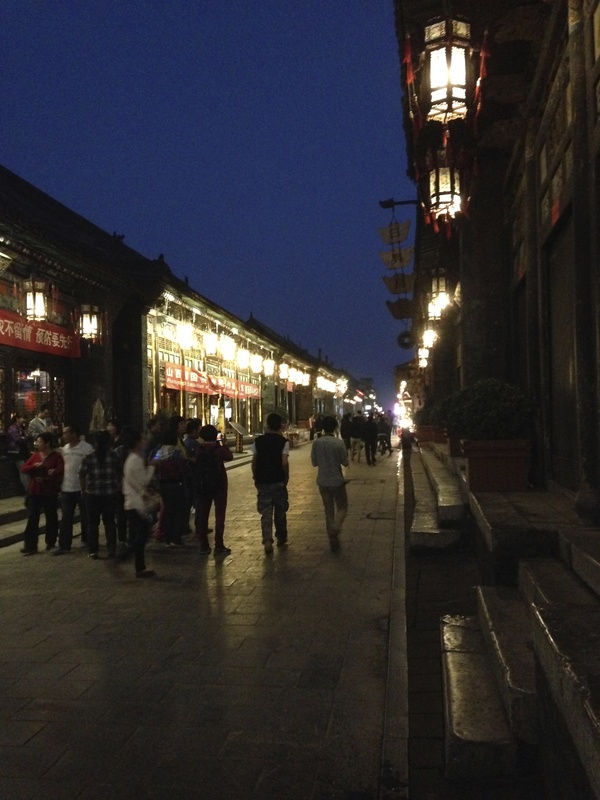 Most Pingyaoren, or people of Pingyao, live in the new city, which is considered more convenient and up-to-date. 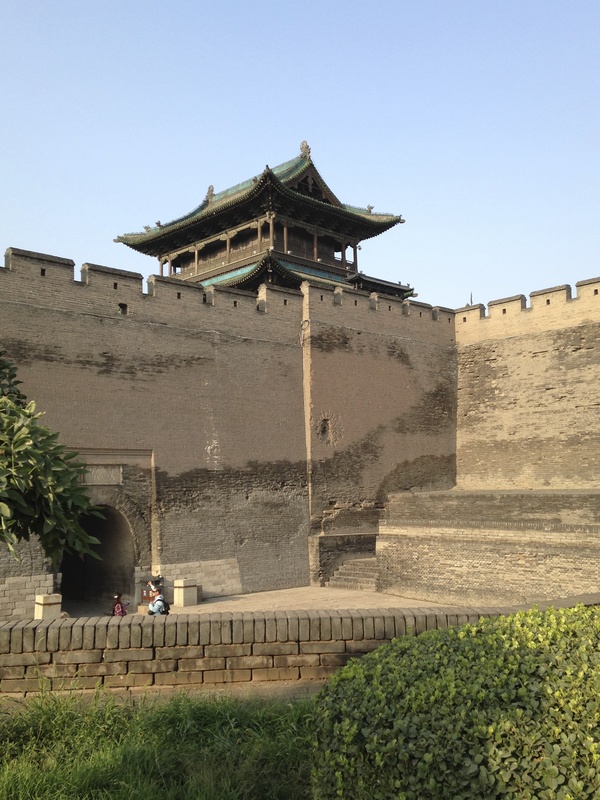 But the heart of Pingyao—the reason that I and thousands of other tourists spent the weekend there—lies within the enclosure of the city wall, in the gu cheng, or ancient city. 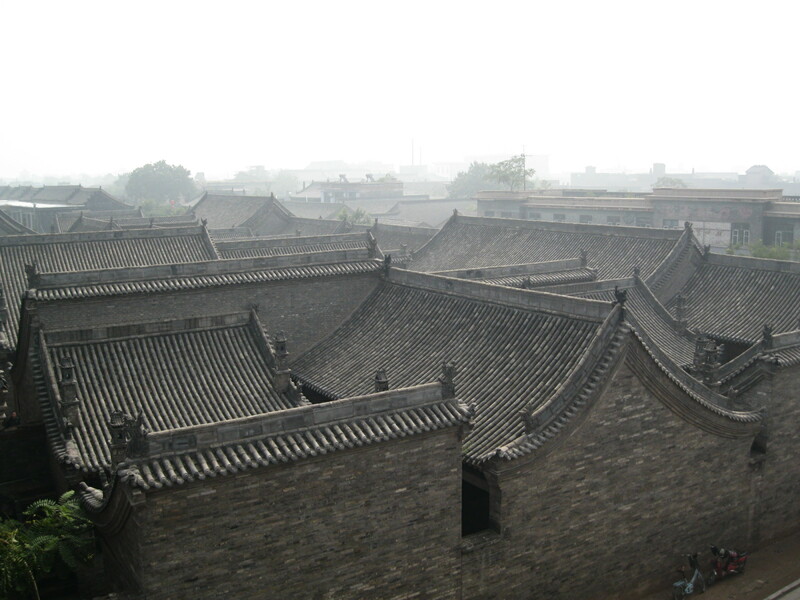 The ancient city is, more or less, what Pingyao looked like during the Ming and Qing dynasties: orderly streets lined with courtyard houses made of the same gray-brown brick as the city wall. People, most of them elderly, still live in the ancient city, but its businesses are all devoted to tourism. The city’s main arteries are the four streets corresponding to the cardinal directions, with South Street serving as the primary tourist hangout, and many of the former residences along these streets have been turned into hotels, restaurants, and shops selling everything from rubber chickens to aromatherapy pillows to local grain alcohol to delicate cut-paper decorations. Nearly all of the visitors to Pingyao during my weekend there were Chinese; I saw only a scattering of other Westerners. On Saturday morning, I started the day at my South Street courtyard hotel with a breakfast of local specialties—two types of cold noodles, cucumber swimming in a chili and vinegar sauce, dense dried tofu tossed with chili peppers, a hard-boiled egg, and two steamed rolls. No coffee, though, so I set out to hunt some down and wound up at the only place open that early, a chain shop called Lemon Exchange that mostly sells bubble tea drinks. My request for an Americano was met with uncertain agreement from the two young men staffing the counter, who both disappeared into the back kitchen to figure out how to make one. I didn’t object when they brought out an espresso, which I forced down while watching a band of drummers perform for the early morning crowds on South Street. I wandered up North Street—a shorter, slightly less chaotic fraternal twin of South Street—to the city wall and had my all-access Pingyao ticket scanned at the bottom of the stairs leading up to the North Gate. As I passed through the turnstile, the ticket collector grabbed my arm and handed me a small laminated card, which I initially assumed would be some list of rules for behavior on the wall. Instead, I saw written in tiny, careful print a request in English for foreign coins to add to his collection. “I’m sorry, I don’t have any,” I responded, feeling bad that I couldn’t offer him anything from the jumble of non-Chinese change that sits in a Ziploc bag on my desk at home. He smiled and waved as I walked away and began climbing the stairs. While the exterior side of the city wall extended above my head, the interior side facing the ancient city stood disconcertingly low—maybe 18 inches at the most. I edged over from time to time to get a better look at the buildings below me, but always quickly retreated to walk close the exterior wall, unable to shake the vertigo that accompanied my brief ventures. Even hugging the wall, I could see the ancient city of Pingyao spread out below me in neat rows of courtyard houses, their roofs forming an undulating sea of gray waves. A haze of coal smoke hung over the city and tinged the air with a smell that I recognized but had nearly forgotten; Shanghai doesn’t sit in China’s coal-burning northern belt. I wanted to walk the entire circumference of the wall, but saw almost as soon as I started out from the northern gate that I wouldn’t be able to accomplish this goal; the northeastern corner was closed for renovations. So I turned west instead, soon putting the biggest crowds at the gate behind me and enjoying what passes for peace and quiet in a Chinese city. I had been confused the night before when another guest checking in at my hotel asked if I was a photographer, but I gradually figured out over the course of Saturday that the city was hosting the Pingyao International Photography Festival, and that this weekend was some sort of large-scale photography camp. Attendees wearing hot-pink lanyards with VIP passes attached around their necks toted massive DSLR cameras and, in some cases, tripods and backpacks of additional equipment as well. Guides led small groups, pointing out photo-worthy sights and explaining the optimal techniques to use in specific circumstances. One of those circumstances was taking pictures of a freckled, redheaded foreign woman; I frequently looked up from the uneven path on top of the wall to find a barrage of oversized lenses pointed at me, amateur photographers waving in thanks as they finished a series of shots. Almost too soon, I had covered the entire open portion of the wall and reached a barrier on the eastern edge that prevented me from proceeding any farther. I descended the staircase, clicked through a turnstile, and came upon a street full of newly painted bars and clubs, including a Cultural Revolution-themed one named 1969. I skipped that and walked up the street to the Confucian Temple, the grounds of which were filled with photography displays and more pink-lanyarded people intently taking pictures. At the City God Temple one street over, I found the same scene; all of Pingyao’s tourist sites had been turned into photography classrooms. I decided to wander and explore the city rather than hit each one of the 19 officially designated tourist attractions that my Pingyao pass entitled me to enter. Walking west from the temples, I soon saw a building with a large cross on top and headed toward that to see that it was Pingyao’s Catholic church. A girl scampered around the church’s courtyard, picking flowers and leaves off bushes, but aside from her, I was the only person around. I headed up the church’s steps and saw a handwritten sign on the door, asking churchgoers to turn off their cell phones and make sure their children act properly during services: “We must put an end to behavior disrespectful to God!” Some things are the same no matter where you go. 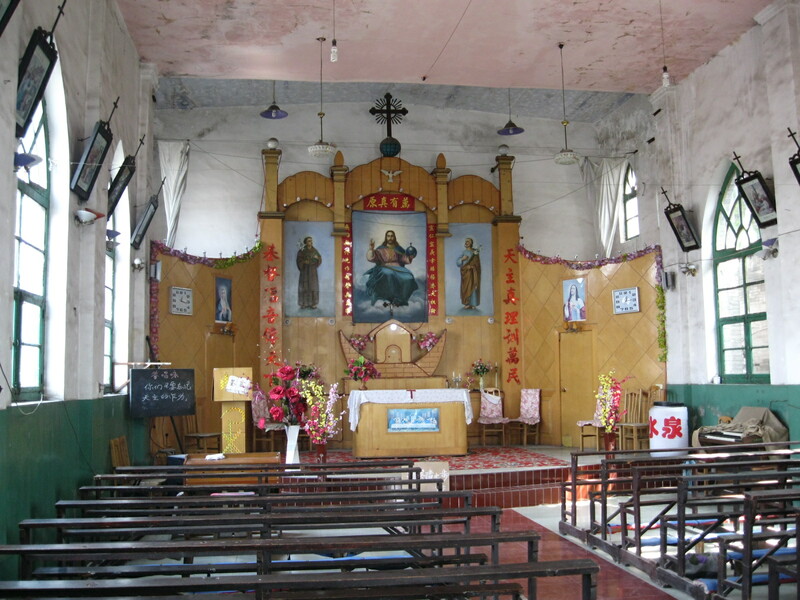 The Pingyao Catholic church, which I’m guessing was built in the early 20th century, had seen better days. Mold bloomed across the ceiling and walls, and the rickety wooden pews looked like they would collapse if knelt on too abruptly. But the altar was decorated with vases of artificial flowers and a new portrait of Pope Francis hung on a pillar above the dish of holy water at the entryway; Pingyao’s Catholics seemed to be doing the best they could with limited resources. I wondered how large the congregation was, but there was no one around to ask. Later in the afternoon, after lunch at one of South Street’s many restaurants, I meandered down to the South Gate and decided to walk along the base of the wall, working my morning route in reverse. No camera-wielding photography campers were in this part of the city, and the streets were free of the golf carts being used to ferry them from site to site. I barely saw anyone, in fact: the high walls and closed gates of the old courtyard houses prevented me from peeking inside. I’d had a better glimpse of life in Pingyao’s ancient city earlier in the day, when I could look down from the height of the wall and catch sight of courtyard vegetable gardens and strings of chili peppers hung on house walls to dry. I managed to walk clockwise from the South Gate to the Upper East Gate before being diverted onto East Street by construction at the base of the wall. The axis streets were filling up as the sun went down, as tourists moved from one shop to the next comparing goods and arguing over prices. Elderly women selling circlets of artificial flowers proved especially skillful vendors: three-year-old girls holding their grandmothers’ hands and teenage girls clutching their boyfriends’ arms alike all convinced their companions to shell out a few yuan for the hair accessory. Walking in the tourist zone was slow-going, as nearly everyone stopped every few feet to pull out their phones or cameras and take a few shots of Pingyao, becoming even more picturesque as the sun set and lanterns lining the street switched on. Pingyao deserves a lot of credit: while many other Chinese cities have been criticized for knocking down original historic buildings and constructing shoddy reproductions in their place, Pingyao’s structures, even those that have been renovated, are top-notch. It’s like the Colonial Williamsburg of China, but without re-enactors. I had much less time to explore on Sunday, since I needed to get to Taiyuan and catch my return flight to Shanghai. I started out the day intending to do exactly what I’d told myself I wouldn’t do on Saturday: work my way through the 19 sites accessible via my Pingyao tourist pass (four of which I’d seen the day before). As much as I enjoy wandering in new places, I also like order and checklists; give me a tour itinerary and I’ll do it. I started out at the courtyard complex containing Ri Sheng Chang, China’s first draft bank, then moved next door to another courtyard house/banking institution, then across the street to a courtyard house/martial arts museum … and then realized that I could only walk through so many courtyard houses. I broke away from the increasingly large crowds—a few tour buses must have pulled in—and headed to the very end of East Street to check out a Daoist temple. Like the two temples I had visited the day before, this one was filled with photography exhibits, which prevented anyone from getting good views of the temple buildings, and I decided that I much preferred strolling around the backstreets of Pingyao to visiting the designated tourist sites. I put my Pingyao pass back in my shoulder bag, having only checked off eight of the nineteen attractions. In the end, I enjoyed Pingyao much more as a place to wander around and soak in the ambiance of a small Qing Dynasty city, rather than as a collection of tourist sites to visit. It’s fascinating to see how quickly the tourist zones disappear once you leave the axis streets, and I wonder what will happen to the old courtyard houses in the quadrants once their elderly residents pass away. The driver who took me to the new high-speed rail station on Sunday afternoon told me that he had grown up in the ancient city but had no desire to live there any longer; apartments outside the city wall are much more modern and convenient. Will the tourist zone slowly grow larger and larger, expanding to fill all of the ancient city? Or will unwanted courtyard homes be knocked down and replaced with new apartment buildings and supermarkets, the tourist industry restricted to the axis streets and the designated sites? I hope that all of the ancient city is designated a historical preservation zone, though I know that such titles don’t always mean much in China. But Pingyao has a good thing going, and it would be smart to ensure that the ancient city’s charm be maintained as much as possible.